A new day dawns on another years cycle ride. Every year every day we set off with a blank sheet of paper for the log and every day we always encounter something to make it worth writing. Breakfast in Cherry Blossom guest house was OK! With mine host fishing for compliments all the time. We shared the breakfast room with an Australian couple and 3 Contractors from Hartlepool who were fitting kitchens in the area. The Australian couple were engrossed in their lap top over breakfast much to Graeme’s amusement. He must be the Australian prime minister mused Graeme having his Lap top with him all the time! After break fast we loaded quickly and left as soon as possible, the landlady was bemoaning her dented and scratched Skoda which she keeps scraping when she takes it out of the garage. Colin gave her a rough quote for a paint job, she offered him a week’s free accommodation for him and Karen in payment, she said that’s how she got her ceilings done! Well we couldn’t keep a straight face. 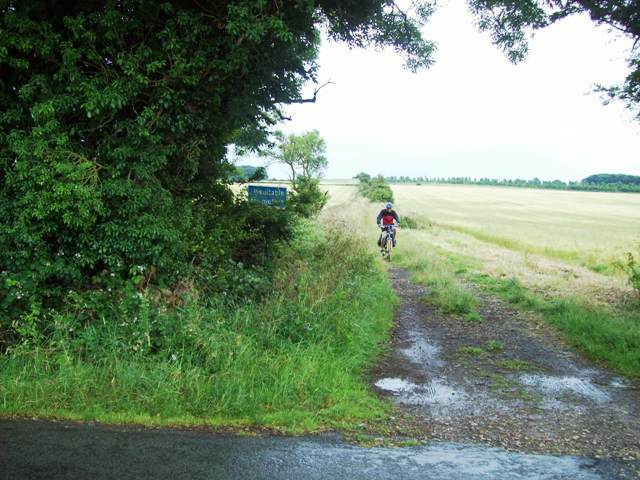 Anyway it was just a short ride out of Stratford and we hit the Stratford Green way nearly ten miles of off road flat riding which pushed us nicely down towards the Cotswolds. 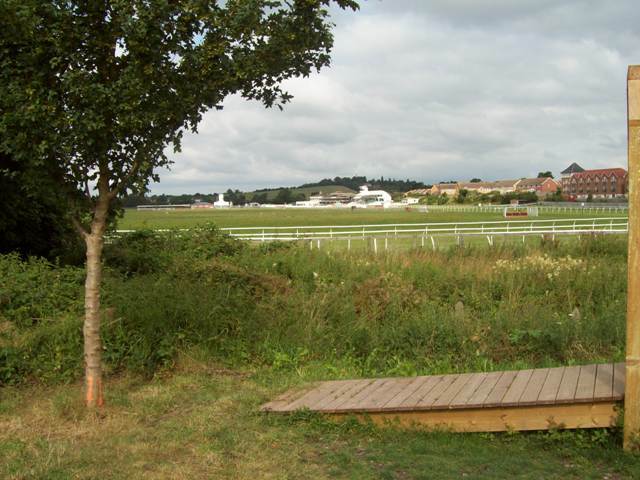 Out past Stratford racecourse too, I was only there few weeks ago. 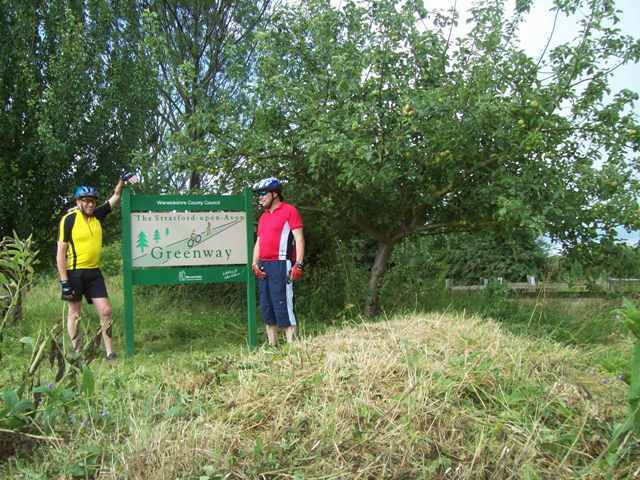 The Greenway is well catered for cyclists and walkers, with old railway carriages converted to cycle hire shops and café’s. Well impressed even if it was so early they were closed. We were on the road by 9 30am which is pretty good for us. We left the Greenway and picked up the quiet flat lanes of South Warwickshire, In the village of Lower Quinton we stopped at the village shop for drink s and supplies, while Colin was in buying, a lady in a black focus was in trouble trying to reverse with a wheel locked up, she was on the phone to her husband and the AA and was in a real panic, till Colin returned and sussed straight away she had just washed the car and one of the wheels was binding on, it freed and he re assured her, and she was on her way. We cant just stop for a drink without some crisis. 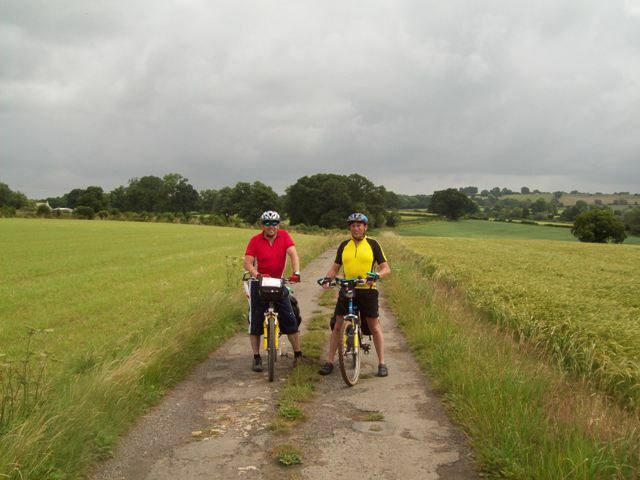 After Lower Quinton the climbs started, we were climbing into the Cotswolds, we knew it would be a lumpy ride off and on to Cirencester. Especially following the quiet lanes. But the countryside is wonderful and it all adds to the fun, even though I struggle on certain, well most hills. As we nudged over the Gloucestershire border Graeme had plotted a lovely unsuitable for motors lane which took us along a lovely ridge into deepest countryside, it was right on the Heart of England Way, and dropped us right down into Chipping Camden, it was my first trip to Chipping Camden, Graeme and Karen had stayed there earlier in the year. Chipping Camden is a pretty Cotswold stone town and it was our first long stop of day, we had a good break a drink and rest. 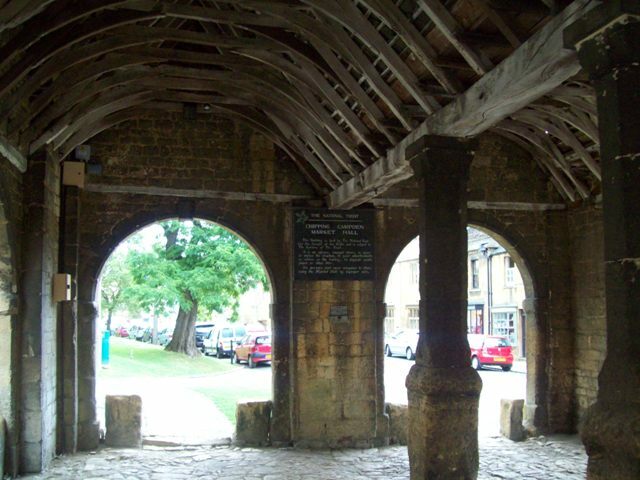 Chipping Camden and its gold stone buildings have remained more or less unaltered since the 14th century, when the town grew wealthy on the wool trade. There was no way round it and we had a steady pull out of Camden as it is in Valley bottom. Through quiet Cotswold stone picture box villages full of picture box cottages with no one around, all were shut down until the weekend! We had another long climb into a small town called Blockley a place I had never heard of either, it was very hilly and a backwater, looking it up on the internet I discovered the only flat piece of Blockley is the Bowling green. The village became famous for its silk mills! After lunch we hit our first hiccup, a Roman road shown on the map which was to take us down towards Bourton on the water. We arrived at the start, the sign said unsuitable for motors, we sent scout (alias the Bishop Bullet) to see what the road and terrain was like! 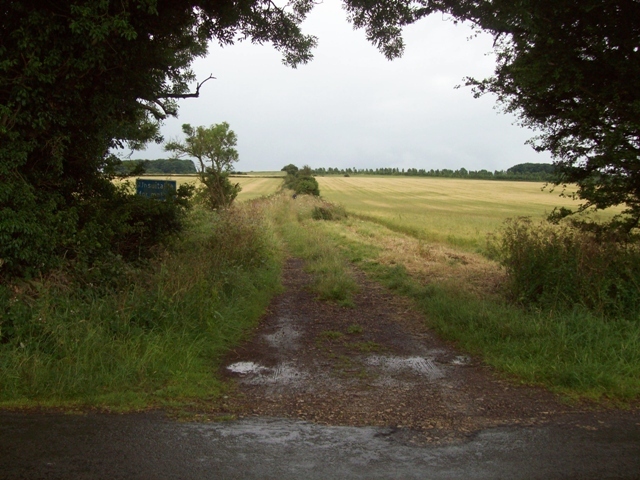 The Roman road, with Colin somewhere in the distance! It was a non starter it was totally overgrown and would slow us down, so we did a short zig zag detour and down to the Slaughter’s, Upper and Lower Slaughter two beautiful Cotswold villages very pretty it was worth the detour. 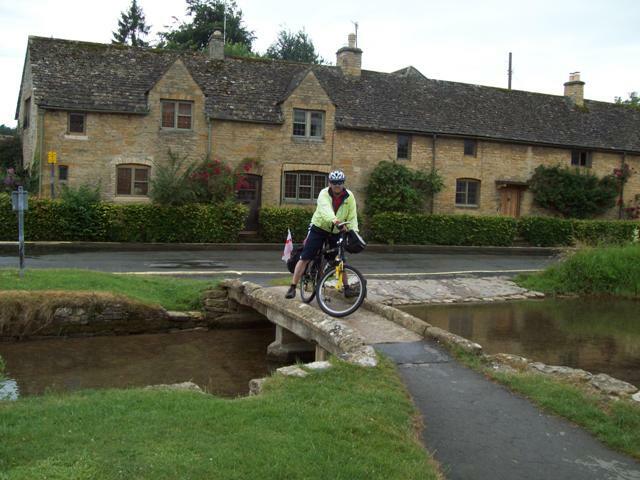 I had been the lower slaughter several times but first time on a bike, it’s a lot easier and you can get parked too. 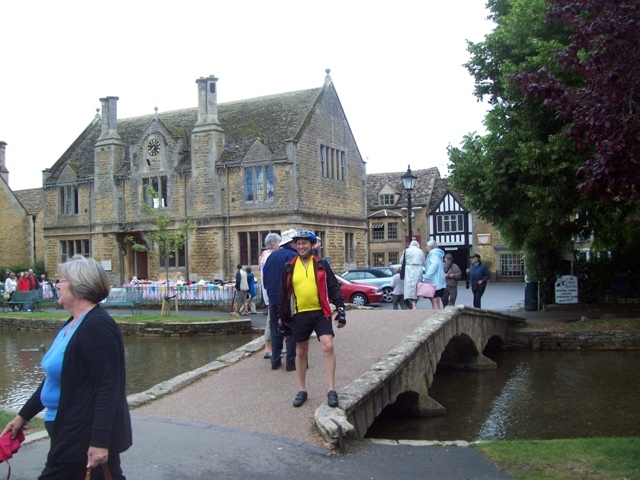 Then onto another tourist spot Bourton on the water the Venice of the Cotswolds Tourists Tour buses, overpriced and over crowded tearooms. We stopped in the centre and took in the scenery. 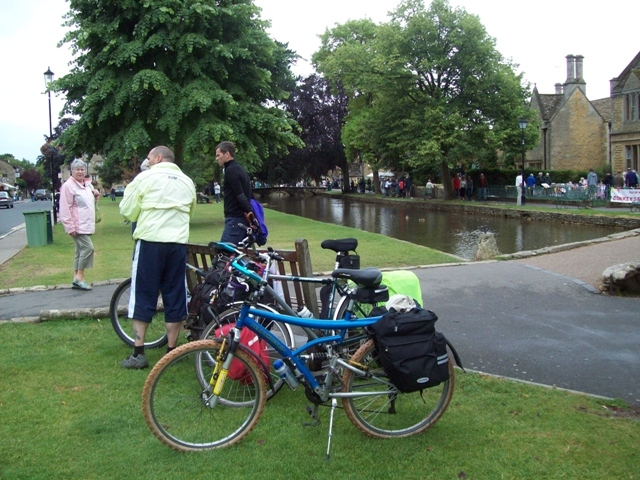 It was pleasant sitting in Bourton but when you stop you switch off and the legs go stiff and yes you were right, just out of Bourton we were into the obligatory climb. But what goes up must come down, and we followed a ridge and then dropped down into Northleach, and the first puncture of the ride just as we were dropping into the town, Graeme ended up with a puncture. We stopped in the town square while Colin repaired the puncture and I bought ice cream and then came back and sat right among Colin’s tools which he had laid out in the bus shelter!!! How did I know!!! And I’d just bought him he’s favourite too a snickers choc bar! While we repaired the puncture a Belgian family arrived on bikes too. Mum Dad and three youngsters all looked experienced cyclists but were having great problems with directions and took an age in a local shop asking directions, they then all cycled off in the opposite direction, much to Graeme’s amusement and his unprintable comments. It was then a wonderful ride down towards Cirencester into a valley with a hamlet called Coln Rogers, with amazing properties and an ancient Church! To quote a well known Multidayman, and it isn’t Colin and it isn’t me!! 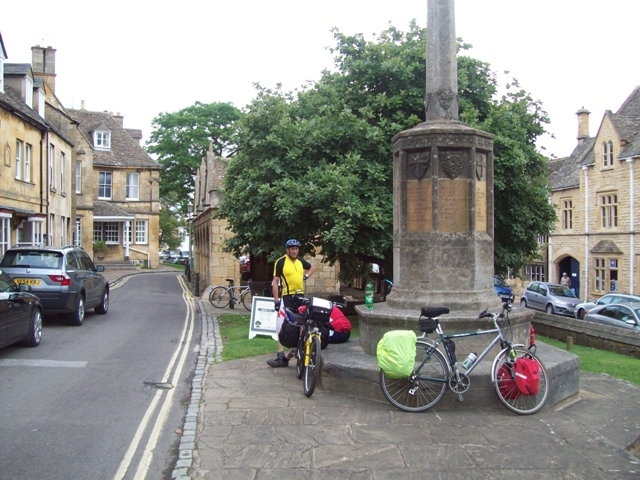 Into Cirencester lovely downhill finish and into the market square, now where are the digs? I asked a taxi driver, thought that would be the best bet, although he was really helpful, he knew where the Digs were but he couldn’t direct me. Well he eventually did, and we found the Leases Guest House Victoria road. What a contrast to Cherry Blossom. Nice friendly landlord who put our bikes straight in the garage, we then had two rooms with an adjoining Shower and Toilet room. Ground floor too and very comfortable. He told us the best eateries and the best pubs! So after the well earned cuppa and shower we were changed and ready to hit the sights and sounds of Cirencester. We found our way into the town via the local park and ended up in the Bear inn, great local ale and we sat outside on a pleasant warm evening reflecting on the day. First port of call was the Waggon and Horses Pub which we had been recommended for food, unfortunately it was quiz night and so no chance of food. Strange quiz too, all the tables were reserved at start of quiz but were still empty, the quizmaster then announced there would be nine rounds with 6 questions per round, then as we left he was onto General knowledge first round question 15? I think it was my heavy soup(Won Ton) get it, I didn’t when the waitress called it that when I ordered it? But we did have a good night in the Chinese restaurant the staff were full of fun and we had a good banter with them. It was then a stroll back to the digs with Colin and me having a great discussion about road markings and their legality if they weren’t painted right, we found several examples walking up Victoria road in Cirencester of incorrectly marked parking restrictions. Back to the digs for a comfortable night after a good night out in Ciren! As the locals call it.